Stocks rose on Monday, erasing sharp losses from earlier in the day, as shares of technology companies posted strong rebounds across the board. The Dow Jones Industrial Average closed 34.31 points higher at 24,423.26, erasing a 507-point drop. The S&P 500 rose 0.2 percent to 2,637.72 while the tech-heavy Nasdaq Composite jumped 0.7 percent to 7,020.52. Facebook shares rose 3.2 percent while Amazon, Netflix and Alphabet all rose more than 0.6 percent. Apple, meanwhile, erased a more than 2 percent pull back to close 0.65 percent higher. Shares of Apple initially fell after a Chinese court granted Qualcomm an injunction against the iPhone maker. It is unclear how the injunction will impact Apple's sales in China, however. Qualcomm says the order bans Apple iPhone imports and sales in China. Apple, meanwhile, says it only impacts sales of phones running an older operating system. 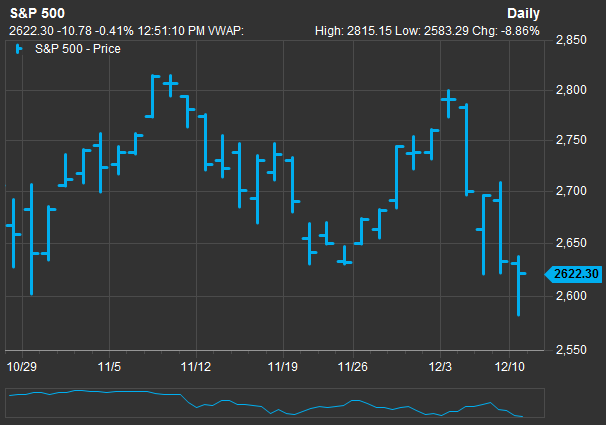 At its lows of the day, the S&P 500 had dipped below its low reached in October during the previous vicious market sell-off. These technical breakdowns typically lead to more selling as many computer programs are set to dump stocks on those levels. Traders pointed to a number of reasons for the initial selling, including a flattening yield curve and a delayed Brexit vote in the United Kingdom. Stocks fell to their lows of the day after UK Prime Minister Theresa May announced the delay of a key Brexit vote in the country's parliament. Originally, it was scheduled to be held Tuesday. Meanwhile, the spread between the short-term 2-year Treasury note yield and its 10-year counterpart further narrowed, potentially signaling an economic slowdown is ahead. Last week, the 3-year Treasury note yield broke above the 5-year rate. This "yield-curve inversion" stoked fears that a recession could be on its way. But strategists at MRB Partners think investors might be overreacting to the moves in Treasury yields. "Markets are now discounting greater weakness than we expect next year," they said in a note. "Our neutral stance on equities and underweight on fixed income corresponds with our expectation that stocks will outperform bonds in the year ahead, albeit in choppy fashion." Monday's moves come after a volatile week for investors. The Dow, S&P 500 and Nasdaq Composite all posted their worst weekly performances since March last week, falling more than 4 percent each, as worries and confusion about the ongoing U.S.-China trade war and fears of an economic slowdown gripped Wall Street. "The volatility continues," said Mark Newton, managing member at Newton Advisors, in a note to clients. "Stocks reversed the prior week's rally violently over the last few days, and now have reached the bottom of the recent trading consolidation that's been in place for the past few months." "Seeing a larger breakdown in the indices at this point would confirm that stocks have definitely started a larger correction that should eventually lead to a bear market," he said. Worries over the ongoing U.S.-China trade relation also weighed on market sentiment. On Sunday, China summoned the U.S. ambassador to Beijing to protest Huawei CFO Meng Wanzhou's detention. Reuters reported, citing the state-run Xinhua News Agency, that Chinese Vice Foreign Minister Le Yucheng called Meng's arrest "extremely egregious." News of Meng's arrest broke last week and is reportedly related to possible violations of U.S. sanctions. The arrest is seen as a potential deterrent to the U.S. and China reaching a permanent deal on trade. Huawei is one of the largest tech companies in China and is seen as symbol of pride by the Chinese government. Meng is scheduled to appear at a bail hearing in Canada later on Monday. The Cboe Volatility Index (VIX), which is considered to be the best gauge of fear on Wall Street, rose to trade as high as 25.94 before pulling back to around 22. "The VIX has now sustained over 15 and an average above 20 since Oct. 8 as uncertainty is coming from multiple fronts," including the trade war, Meng's arrest, Brexit and interest rates, said Jeff Chang, managing director at Cboe Vest. "If any one of these events were to breakdown further, we could very easily the VIX to be well above the 25 levels we have seen recently."